Summary:© 2015 WILEY-VCH Verlag GmbH & Co. KGaA, Weinheim. Abstract Recently, the process by which energy is transferred from photoexcited semiconductor nanocrystals, called quantum dots (QDs), to other semiconductors has attracted much attention and has potential application in solar energy conversion (i.e., QD-sensitized solar cells). Sensitization of wide band gap polyoxometalates (POMs) to visible light by using CuInS2 QDs dispersed in an organic solution is demonstrated herein. Photoluminescence quenching and lifetime studies revealed efficient electron transfer from the CuInS2 QDs to POMs, such as SiW12O40 and W10O32, that were hybridized with a cationic surfactant. CuInS2 QDs function as an antenna that absorbs visible light and supplies electrons to the POMs to enable certain photocatalytic reactions, including noble-metal-ion reduction. The photoenergy storage capabilities of the QD-POM system, in which electrons photogenerated in QDs by visible-light excitation are trapped and accommodated by POMs to form reduced POM, are also demonstrated. Electrons stored in the POM can be later discharged through reductive reactions, such as oxygen reduction, in the dark. Enhanced capabilities: CuInS2 quantum dots (QDs) are used to sensitize polyoxometalates (POMs) with wide band gaps. Visible-light-induced photocatalytic reactions proceed through the formation of one-electron-reduced POMs, which also show photoenergy-storing properties (see figure). Summary:© 2015 American Chemical Society. The effect of water vapor on Pd-loaded SnO2 sensor was investigated through the oxygen adsorption behavior and sensing properties toward hydrogen and CO under different humidity conditions. On the basis of the theoretical model reported previously, it was found that the mainly adsorbed oxygen species on the SnO2 surface in humid atmosphere was changed by loading Pd, more specifically, for neat SnO2 was O-, while for 0.7% Pd-SnO2 was O2-. The water vapor poisoning effect on electric resistance and sensor response was reduced by loading Pd. Moreover the sensor response in wet atmosphere was greatly enhanced by loading Pd. It seems that the electron depletion layer by p-n junction of PdO-SnO2 may impede OH- adsorption. (Graph Presented). Summary:© 2015 Elsevier B.V. All rights reserved. Using the same protocol for precipitation of tin hydroxide and its hydrothermal treatment (HT), we synthesize SnO2 from three precursors - tin(IV) acetate, tin(IV) hydroxide acetate and tin(IV) chloride pentahydrate. After annealing on sensor substrates the materials were found to be very similar from structural point of view. However, their sensing properties (responses to CO and H2 as a function of humidity) were discovered to be very different, which was related to different impurity level in the samples. High amount of chlorine and potassium (ca. 300 ppmw) in two samples corresponded well to notably high water vapor effect. Differences in surface areas (within 20-60 m2/g) and pore volumes (between 0.11 and 0.19 cm3/g), found for the materials in question, seem to play minor role if the impurities are present. Summary:© 2015 Elsevier Ltd. and Techna Group S.r.l. All rights reserved. Selective oxygen separation from air was performed using perovskite-type oxide membranes made of Ba0.95La0.05FeO3-δ. We demonstrated that surface modification of Ba0.95La0.05FeO3-δ membranes with La1-xSrxFeO3-δ catalyst layers led to an increase in oxygen permeation fluxes at 700-930 °C. We studied the effects of oxygen vacancy amounts, surface area, particles size, surface treatment of La1-xSrxFeO3-δ on the oxygen permeability of the membranes fitted with La1-xSrxFeO3-δ catalyst layers. Among the catalyst layers tested, the membranes fitted with La0.9Sr0.1FeO3-δ (x=0.1) showed the highest oxygen permeation flux probably because of its higher porosity and uniform morphology without open voids, which would increase the number of surface reaction sites. The obtained results suggest the feasibility of further upgrading the membrane performance by using surface catalyst layers having a homogeneous morphology and a different composition from that of the mother membrane. Summary:Gas sensing with nanosized oxide materials is attracting much attention because of its promising capability of detecting various toxic gases at very low concentrations. In this study, using clustered SnO2 nanoparticles formed by controlled particle aggregation, we fabricated highly sensitive gas sensing films to detect large gas molecules such as toluene. A hydrothermal method using stanic acid (SnO2·nH2O) gel as a precursor produced monodispersed SnO2 nanoparticles of ca. 5 nm at pH 10.6. Decreasing the solution pH to 9.3 formed SnO2 clusters of ca. 45 nm that were assemblies of the monodispersed nanoparticles, as determined by dynamic light scattering, X-ray diffraction, and transmission electron microscopy analyses. Porous gas sensing films were successfully fabricated by a spin-coating method using the clustered nanoparticles due to the loose packing of the larger aggregated particles. The sensor devices using the porous films showed improved sensor responses (sensitivities) to H2 and CO at 300 °C. The enhanced sensitivity resulted from an increase in the film's porosity, which promoted the gas diffusivity of the sensing films. Pd loading onto the clustered nanoparticles further upgraded the sensor response due to catalytic and electrical sensitization effects of Pd. In particular, the Pd-loaded SnO2 nanoparticle clusters showed excellent sensitivity to toluene, able to detect it at down to low ppb levels. © 2014 American Chemical Society. Summary:Tungsten trioxide (WO3) is one of the important multifunctional materials used for photocatalytic, photoelectrochemical, battery, and gas sensor applications. Nanostructured WO3 holds great potential for enhancing the performance of these applications. Here, we report highly sensitive NO 2 sensors using WO3 nanolamellae and their sensitivity improvement by morphology control using SnO2 nanoparticles. WO 3 nanolamellae were synthesized by an acidification method starting from Na2WO4 and H2SO4 and subsequent calcination at 300 °C. The lamellae were characterized by X-ray diffraction (XRD), scanning electron microscopy (SEM), and transmission electron microscopy (TEM), which clearly showed the formation of single-crystalline nanolamellae with a c-axis orientation. The stacking of each nanolamella to form larger lamellae that were 50-250 nm in lateral size and 15-25 nm in thickness was also revealed. From pore size distribution measurements, we found that introducing monodisperse SnO2 nanoparticles (ca. 4 nm) into WO3 lamella-based films improved their porosity, most likely because of effective insertion of nanoparticles into lamella stacks or in between assemblies of lamella stacks. In contrast, the crystallite size was not significantly changed, even by introducing SnO2. Because of the improvement in porosity, the composites of WO3 nanolamellae and SnO2 nanoparticles displayed enhanced sensitivity (sensor response) to NO2 at dilute concentrations of 20-1000 ppb in air, demonstrating the effectiveness of microstructure control of WO3 lamella-based films for highly sensitive NO2 detection. Electrical sensitization by SnO2 nanoparticles was also considered. © 2014 American Chemical Society. Summary:Water isotope exchange in the presence of CO on two undoped tin dioxides has been studied using modulation excitation diffuse reflectance infrared Fourier transform spectroscopy (DRIFTS) and resistance measurements at 300 C. Our results reveal that the material synthesized from tin tetrachloride (SnO2Cl) manifests higher affinity to chemisorbed water than that made from tin hydroxide acetate (SnO2Ac). The latter was shown to exhibit a strong correlation between the evolution of surface OH groups (bridging type, involved in hydrogen bonding) and electric resistance upon increasing concentration of CO. Water desorption kinetics, being independent of CO concentration for both materials, was found to be slower for SnO 2Cl by ca. 30% with respect to SnO2Ac. High affinity to water as well as low sensor signals to CO in humid air reported for SnO 2Cl were proposed to originate from traces of Cl ions (about 0.15 wt % for SnO2Cl and 0.03 wt % for SnO2Ac) and not microstructure, which has been confirmed to be similar for both materials. Two types of water adsorption and two CO sensing mechanisms are proposed for SnO2Cl and SnO2Ac on the basis of the results. © 2013 American Chemical Society. Summary:The gas sensing properties of polyhedral α-Fe2O 3 particles were investigated. The polyhedral α-Fe 2O3 particles were synthesized via a modified polyol method with the addition of an extra amount of NaBH4 in ethylene glycol, and fabricated to a thick gas sensing film after calcination at 500°C and 900°C. The polyhedral α-Fe2O3 particles exhibited a p-type nature, which is a new result opposite to other results of recent reports of semiconductor gas sensors using α-Fe 2O3. In particular, we suggest that the difference between structure and morphology of α-Fe2O3 particles can lead to p-type and n-type characterization. In addition, we suggested that Na ions from NaBH4 were incorporated into α-Fe2O 3 oxide. They are the cause of the generation of holes in α-Fe2O3 oxide that led to the p-type nature of α-Fe2O3 oxide. The measurement of the sensor response to hydrogen, carbon monoxide, toluene, propane and ethanol revealed that the sensor device synthesized using polyhedral α-Fe2O 3 particles is sensitive to hydrocarbons and ethanol. Importantly, the sensor device using polyhedral α-Fe2O3 particles calcined at 900°C was strongly sensitive to ethanol due to the porous structure of the α-Fe2O3 particles. © 2014 The Royal Society of Chemistry. Summary:In the present research, large iron oxide microparticles with large sizes in the range of 1-5 μm have been facilely synthesized by a modified polyol method with NaBH4 as a versatile strong reducing agent. We found that the highly homogeneous iron oxide microparticles' novel structure is the best pure crystal phase of α-Fe2O3 in terms of polyhedral morphology and shape in existence. There are no diffraction peaks of other crystal phases from impurities in α-Fe2O3 microparticle products in the crystal growth. Interestingly, a new method of heat treatment or atomic surface deformation allowed for the discovery of a new large α-Fe2O3 structure with controlled specific α-Fe2O3 oxide grains in the crystal structure. The severe surface deformation of sharp, polyhedral, large α-Fe 2O3 microparticles under a sintering treatment was found to give un-sharp, polyhedral large α-Fe2O3 microparticles with specific grains and boundaries. © 2014 The Royal Society of Chemistry. Summary:Solution-processed photovoltaic (PV) devices based on semiconductor nanocrystals (NCs) such as Cu2ZnSnS4 (CZTS) and CuInS 2 (CIS) are attracting much attention for use in next-generation solar cells. However, the performance of NC-based devices is hindered by insulating surface-capping ligands that limit transfer/transport of charged carriers. Here, to remove surface-capping ligands (long-chain fatty amines) from NCs, we use the strong alkylating agent methyl iodide, which converts primary amines to quaternary amines that have low coordinating affinity to the NC surface. X-ray diffraction, Raman spectroscopy, and Fourier transform infrared spectroscopy analyses confirm the successful removal of capping ligands from the CZTS surface after treatment with methyl iodide without changing the crystal structure of CZTS. CZTS and CIS NC-based devices treated with methyl iodide exhibit a reproducible PV response under simulated sunlight. The developed route can potentially enhance the performance of NC-based devices used in a broad range of applications. © 2013 American Chemical Society. Summary:Oxygen adsorption plays key roles in resistive-type SnO2 gas sensors that can very sensitively detect combustible gases such as CO and hydrocarbons. Thus, exact evaluation of the electric resistance of SnO 2 in response to oxygen is important to understand the oxygen adsorption mechanism. However, infinitesimal impurities contained in even high-grade commercial oxygen cylinders impose great effect on the sensitivity of SnO2. In this study, we designed an experimental system, which composed of gas pretreatment chambers including a Pt/Al2O3 combustion catalyst and a zeolite adsorbent, for exact analysis of gas sensing properties. Our experimental system allowed for the accurate determination of the dependence of the electrical resistance (R) on oxygen partial pressure (PO2) by removing impurities in sample gases. According to the linear correlation between R versus PO2 1/4, we concluded that oxygen adsorbed on the SnO2 surface in the form of O2- at 350 and 450°C in extremely dry conditions that was achieved using the experimental system. The competitive adsorption on the SnO2 surface in the form of O- and O2- was suggested at 300°C. © 2014 The Electrochemical Society. Summary:Gas sensing is an important application of metal oxides. The gas sensor response of metal oxide films is greatly influenced by particle size, pore size, thickness, and surface states. To study the effects of particle and pore sizes of sensing films on sensitivity, we fabricated SnO2-based films with different particle and pore sizes and studied sensor responses to three different gases: H2, CO, and H2S with different Knudsen diffusion coefficients. The pore size radii of the gas sensing films were successfully controlled from 2.8 to 5.5 nm using SnO2 nanoparticles of different sizes (4-17 nm diameter) that were synthesized by seed-mediated growth under hydrothermal conditions. Sensor response to H2 increased with decreasing particle size because of the formation of an electron depletion layer within the nanosized crystals. In contrast, the response to CO and H 2S increased with increasing particle size and the resultant pore size. Using the Knudsen diffusion-surface reaction equation, we simulated a gas concentration profile within the films, which revealed that the diffusion of CO and H2S is limited by small pores because of their lower diffusion rates compared with H2. We show that controlling the pore size of the sensing films produces ultrasensitive films, and a large resistance change by 4 orders of magnitude is achieved in response to a low concentration of H 2S (5 ppm). © 2013 American Chemical Society. Summary:Carbon-supported La1-xCaxMn1-yFe yO3 nanoparticles were synthesized, and their oxygen reduction activities and electronic states were investigated. A reverse micelle method using KMnO4 as a source of high valence state Mn successfully yielded carbon-supported La1-xCaxMn1-yFe yO3 nanoparticles even when calcined under a reducing atmosphere. The oxygen reduction activity of carbon-supported La 1-xCaxMn1-yFeyO3 exceeded that of carbon-supported Pt nanoparticles when the Ca composition was limited to the range of 0.4 to 0.8. X-ray photoelectron spectroscopy (XPS) measurements of La1-xCaxMn1-yFeyO3 particle surfaces revealed the existence of Mn4+, which is important in the oxygen reduction activity. Depth analysis of La1-xCa xMn1-yFeyO3 nanoparticles by XPS revealed the formation of a CaCO3 impurity and an A-site deficient perovskite-type oxide containing a high surface concentration of Mn 4+. © 2013 American Chemical Society. Summary:The discharge/charge performance of Li-air cell using the carbon-supported LaMn0.6Fe0.4O3 nanoparticle as a cathode catalyst was investigated in this study. The carbon-supported LaMn 0.6Fe0.4O3 nanoparticle was prepared via a reverse homogeneous precipitation method, and fabricated to air electrode. Li-air cell was constructed using air electrode, Li metal foil and 1.0 M LiPF6 in propylene carbonate as a cathode, anode and electrolyte, respectively. As the result, the carbon-supported LaMn0.6Fe 0.4O3 nanoparticle exhibited both the oxygen evolution activity and the oxygen reduction activity in the non-aqueous electrolyte. The investigation about the presence and absence of the catalytic layer and the gas diffusion layer revealed that each layer is indispensable for the excellent electrode performance, and that the catalytic layer and the gas diffusion layer has a important role to supply the electrolyte and the oxygen gas, respectively. The investigation about the amount of the catalytic layer and the effect of the oxygen concentration revealed that the oxygen diffusability into the air electrode strongly affects to the discharge capacity of Li-air cells. © 2013 Elsevier B.V. All rights reserved. Summary:A catalytic combustion-type gas sensor using a positive temperature coefficient (PTC) thermistor, which shows a sharp resistance change around Curie temperature, was developed for the detection of hydrogen. La-doped BaTiO 3 (Ba0.998 La0.002 TiO3) was prepared through a solid-state method and an oxalic acid method. La-doped BaTiO3 obtained by the oxalic acid method showed improved PTC properties, due to the formation of fine particles, as compared to that prepared with the solid-state method. The resulting sensor device showed a fairly high H2 sensitivity in the range of 100-1000 ppm. In addition, the H 2 sensitivity and response speed were improved by coating a Pt/SiO2 catalyst on the sensor device because the catalytic combustion efficiency of H2 was improved by the catalyst coating. © 2013 The American Ceramic Society. Summary:An impregnation method has been proposed to prepare Pd-loaded WO3 nanolamellae for the gas sensing application. WO3 nanolamellae were synthesized via an acidification method and impregnated with H2Pd2Cl4 solution followed by an ammonia washing treatment. The microstructure and H2 sensing characteristics of the Pd-loaded WO3 nanolamellae were investigated. Electron microscopy studies revealed that PdO particles have been deposited on the surfaces of WO3 with a diameter ranging from 3 to 15 nm. With quite a small amount of Pd, the sensor resistivity was greatly enhanced and it demonstrated an extremely large response to the reduced gas. It was found that sensing response at low temperature increased dramatically with a rise in the gas concentration for Pd-loaded sensors. However, the sensor response at high temperature quickly saturated with increasing the H2 concentration for larger amount of Pd loading. An enhanced combustion effect of Pd and chemical adsorbed water could be responsible for such a saturation of sensing response at high temperatures. © 2013. Summary:In our present research, bottom-up self-assembly of gold (Au) nanoparticles on a flat copper (Cu) substrate is performed by a facile method. The very interesting evidence of self-assembly of Au nanoparticles on the top of the thin assembled layer was observed by scanning electron microscopy (SEM). We had discovered one of the most general and simple methods for the self-assembly of metal nanoparticles. The general physical and chemical mechanisms of the evaporation process of the solvents can be used for self-assembly of the as-prepared nanoparticles. The important roles of molecules of the used solvents are very critical to self-assembly of the as-prepared Au nanoparticles in the case without using any polymers for those processes. It is clear that self-assembly of such one nanosystem of the uniform Au nanoparticles is fully examined. Finally, an exciting surface plasmon resonance (SPR) phenomenon of the pure Au nanoparticles in the solvent was fully discovered in their exciting changes of the narrow and large SPR bands according to synthesis time. The SPR was considered as the collective oscillation of valence electrons of the surfaces of the pure Au nanoparticles in the solvent by incident ultraviolet-visible light. Then, the frequency of light photons matches the frequency of the oscillation of surface electrons of the Au nanoparticles that are excited. © 2013 Nguyen Viet Long et al. Summary:To develop a portable gas sensor with low power consumption, we deposited a micro size sensing film (100 × 100 μm2) on a Si substrate with an integrated micro heater and electrodes constructed using micro-electro- mechanical system (MEMS) technology. TiO2 nanotubes ca. 500nm long with a 50 nm diameter were used to sense and detect volatile organic compounds (VOCs). We demonstrate that the MEMS sensor responded well to ethanol and toluene in air at elevated temperatures, such as 500 °C, which suggests that it is a promising battery-operable micro gas sensor for detecting VOCs. © 2013 The Japan Society of Applied Physics. Summary:In recent years, the recovery of noble metals from waste has become very important because of their scarcity and increasing consumption. In this study, we attempt the photochemical recovery of noble metals from solutions using inorganic-organic hybrid photocatalysts. These catalysts are based on polyoxometalates such as PMo12O40 3-, SiW 12O40 4-, and γ-SiW10O 36 8- coupled with a cationic surfactant, dimethyldioctadecylammonium (DODA). The three different photocatalysts dissolved in chloroform were successful in photoreducing gold ions dissolved in water in a two-phase (chloroform/water) system under UV irradiation (λ < 475 nm). The γ-SiW10O36/DODA photocatalyst exhibited the best activity and recovered gold from solution efficiently. It was suggested that one-electron reduced γ-SiW10O36 9- formed by the UV irradiation reduced gold ions. As a result, large two-dimensional particles (gold nanosheets) were produced using the γ-SiW10O36/DODA photocatalyst, indicating that the reduction of gold ions occurred at the interface between chloroform and water. The γ-SiW10O36/DODA photocatalyst was able to recover metals such as platinum, silver, palladium, and copper from deaerated solutions. The selective recovery of gold is possible by controlling pH and oxygen concentration in the reaction system. © 2013 American Chemical Society. Summary:We have already demonstrated that an air electrode using LaMnO 3-supported on LaNiO 3 efficiently works as a bi-functional air electrode for oxygen reduction and evolution. In order to improve the bi-functional activity, high specific surface area of nano-LaNiO 3 was prepared by a new route using ZnO particles as an aggregation inhibitor. Nano-sized LaNiO 3 (ca. 40 nm) was successfully prepared after removing ZnO by KOH solution from a LaNiO 3-ZnO mixture prepared by a reverse homogeneous precipitation (RHP) method. The result showed that increasing the surface area of LaNiO 3 support is very effective in improving both the oxygen reduction and evolution activities. © 2012 Elsevier B.V.
Summary:A stable sol suspension of Pd-loaded SnO 2 nanocrystals, which is valid for both fundamental studies of semiconductor gas sensor and fabrications of a micro gas sensor, was fabricated by the photochemical deposition of PdCl 4 2- onto SnO 2 in an aqueous solution. UV light was irradiated on a mixture of a SnO 2 sol obtained through a hydrothermal treatment of stannic acid gel in the presence of PdCl 4 2- and ethanol/water at pH 2. A stable sol suspension of Pd-loaded SnO 2 was successfully obtained by controlling the pH of the above suspension to 10.5 after UV irradiation. Thin-film type sensor devices (film thickness ∼200 nm) using Pd-loaded SnO 2 nanocrystal were successfully fabricated by a spin-coating method. Gas sensing measurements showed that the deposition of Pd on the SnO 2 nanocrystals resulted in large electrical sensitization effect. The maximum gas sensitization effect was obtained at 0.125 mol % Pd loading. Moreover, the Pd loading lowered the temperature, in which the maximum sensor response to H 2 was obtained, due to the efficient catalytic combustion of H 2 on Pd. © 2012 American Chemical Society. Summary:To verify theoretical model based on the surface depletion effect of oxide semiconductor in small crystallite, the SnO 2 particles of different crystallite size and donor density were prepared by controlling heat-treatment temperature and Fe 3+ doping concentration, respectively. In addition, Fe 3+-doped SnO 2 was compared with Fe 2O 3-loaded SnO 2 to discuss the effect of donor density. The electrical resistance and sensor response of prepared SnO 2 films were measured in various partial pressures of oxygen and hydrogen. As results, both undoped-and Fe 3+-doped SnO 2 showed the volume depletion in the oxygen concentration of more than 2.5% at 350°C. The dependence of electrical resistance on oxygen partial pressure for smaller crystallite had steeper slope. Furthermore Fe 3+-doping improved the sensor response to hydrogen, while the Fe 2O 3-loading did not work. Good agreement between experimental data the volume depletion theory was found. © 2012 The Electrochemical Society. Summary:We investigated the H2 sensing properties of a catalytic combustion-type hydrogen sensor using a BaTiO3-based positive temperature coefficient (PTC) thermistor as a transducer. In this sensor, catalytic combustion of H2 on Pt electrodes or a catalyst layer induces a remarkable change in the electric resistance as a sensor signal when the operating temperature is set near the Curie temperature of BaTiO3 (120 °C). However, the sensor response to H2 is relatively low at lower H2 concentrations because of lower combustion efficiency near 120 °C. In this study, Ba0.9(Bi0.5Na 0.5)0.1Ti0.999Nb0.001O3 (BNN-BT) with a higher Curie temperature (146 °C) was used as a transducer to increase the operating temperature and thus improve the sensor response. The sensor using BNN-BT and a Pt/SiO2 combustion catalyst showed improved sensor responses particularly at lower H2 concentrations. It also showed good response and recovery behaviors in response to 100-1000 ppm H 2 in air. Copyright © 2011 American Scientific Publishers. Summary:The loading of noble metals was carried out to enhance the gas sensing characteristics of TiO2 nanotube-based sensors. Using a photochemical deposition method, Au nanoparticles were successfully deposited on TiO 2 nanotubes prepared by a hydrothermal method in a highly-dispersed state. The sensor device using a porous film composed of the Au-loaded (0.5 wt%) TiO2 nanotubes exhibited improved sensor responses to 10-50 ppm toluene in air at 500 °C. The sensor response was about two times higher than that of a sensor using commercial TiO2 nanoparticles (degussa P-25). The results demonstrate that the Au loading is a very efficient method for improving the sensing characteristics of TiO2 nanotube-based sensors operative at high temperatures. Copyright © 2011 American Scientific Publishers. Summary:Detection of volatile organic compounds (VOCs) has attracted considerable attention for indoor air quality and human breath analysis. Here, resistive-type gas sensors with porous films made of Au-loaded TiO2 nanotubes were developed for the detection of large-sized VOCs. Well-dispersed Au nanoparticles (10 to 20 nm) were photo-chemically deposited on TiO2 nanotubes (80nm in diameter, 700nm in length) prepared by a hydrothermal method. The device using the Au-loaded TiO2 nanotubes showed improved sensor responses to ethanol and toluene (50 ppm) in air at 500°C. This suggested that Au nanoparticles deposited on the surface of TiO2 nanotubules without aggregation. We also demonstrated that the device could be used for the detection of largesized VOC molecule, i.e., 2,6-diisopropylphenol (propofol), an intravenously administered hypnotic drug for induction and maintenance of anesthesia. The Au-loaded TiO2 nanotubes would offer a way to continuously monitor a change in the concentration of VOCs in exhaled air for medical diagnostics. © 2011 The Ceramic Society of Japan. Summary:Porous gas sensing films composed of TiO2 nanotubes were fabricated for the detection of volatile organic compounds (VOCs), such as alcohol and toluene. In order to control the microstructure of TiO2 nanotubular films, ball-milling treatments were used to shorten the length of TiO2 nanotubes and to improve the particle packing density of the films without destroying their tubular morphology and crystal structure. The ball-milling treatment successfully modified the porosity of the gas sensing films by inducing more intimate contacts between nanotubes, as confirmed by scanning electron microscopy (SEM) and mercury porosimetry. The sensor using nanotubes after the ball-milling treatment for 3 h exhibited an improved sensor response and selectivity to toluene (50 ppm) at the operating temperature of 500 °C. However, an extensive ball-milling treatment did not enhance the original sensor response, probably owing to a decrease in the porosity of the film. The results obtained indicated the importance of the microstructure control of sensing layers in terms of particle packing density and porosity for detecting large sized organic gas molecules. © 2010 Elsevier B.V. All rights reserved. Summary:The durability of carbon-supported La-Mn-based perovskites for the oxygen reduction reaction in strong alkaline solutions was investigated. Carbon-supported perovskite-type oxide nanoparticles were prepared by using a reverse micelle method. The durability of the carbon-supported LaMnO3 nanoparticles was compared with that of carbon-supported LaMnO3 prepared by the mechanical mixing of LaMnO3 with the carbon support. As a result, the durability of the carbon-supported LaMnO3 nanoparticles was less than that of the carbon-supported LaMnO3 prepared by the mixing method due to a difference in the surface area of LaMnO3, which has an effect on the oxygen reduction reaction. In order to improve the durability of the carbon-supported LaMnO3 nanoparticles, Ca and Fe were substituted at the A-sites and B-sites of the perovskite lattice, respectively. As a result, it was found that the partial substitution of Ca and Fe is effective in improving the durability of LaMnO 3 under cathodic polarization in strong alkaline solutions. In particular, the substitution of Ca at the A-site not only improved the durability of the oxide but also enhanced the oxygen reduction activity owing to an increase in the average valence state of the B-sites of the perovskite lattice. © 2011 The Electrochemical Society. Summary:Carbon supported-electrocatalysts are principally used as catalytic layers for air electrodes of metal air batteries. However, these types of air electrodes are problematic because the carbon support can be oxidized to water soluble organic compounds under anodic polarization for a charge process. In this study, we have investigated to use LaNiO3 as a possible electrode material to replace the carbon support because LaNiO3 has both high electric conductivity and high oxygen evolution activity. LaNiO 3 was prepared by a reverse homogeneous precipitation method, and then LaMnO3, which is active for oxygen reduction reactions, was successfully loaded onto the LaNiO3 by using a reverse micelle method. LaNiO3 had a much higher stability against anodic polarization as compared to carbon support. The LaMnO3/LaNiO 3 composite electrode showed excellent bi-functional oxygen reduction/evolution activity in an alkaline solution and this makes it a highly potential candidate for use in rechargeable metal-air batteries. © 2011 The Electrochemical Society. Summary:To obtain a highly active and low-cost oxygen reduction electrode, as compared with a Pt-loaded carbon electrode, a nano-sized La-Mn-based perovskite-type oxide on a carbon support was prepared through the reverse-micelle method. An gas diffusion oxygen reduction electrode using nano-sized La0.4Ca0.6Mn0.9Fe 0.1O3 as a electrocatalyst allowed a electrode potential as high as -50 mV (vs HgHgO) in 9 moll NaOH at 500 mA cm-2. This electrode potential is much higher than the electrode potential of carbon-supported Pt nanoparticles at the same current density. This result suggests that nano-sized La0.4Ca0.6Mn0.9Fe 0.1O3 is a promising candidate as an alternative oxygen reduction catalyst of Pt nanoparticles. © 2011 The Electrochemical Society. All rights reserved. Summary:A solid-state C O2 sensor device using a metal-insulator-silicon carbide (MISiC) capacitor combined with a Li2 C O3 -BaC O3 auxiliary layer was fabricated and tested for its basic sensing properties. The MISiC-based C O2 sensor attached with the carbonate showed typical capacitance-voltage (C-V) properties in air at 400°C, and the sensor device responded well to changes in C O2 concentration in air at 400°C. The sensor signals were directly proportional to the logarithm of C O2 concentration. The results suggested that an electrochemical reaction of C O2 occurred at the interface between the carbonate layer and the electrode, causing the applied voltage to shift in response to C O2. © 2010 The Electrochemical Society. Summary:In order to enhance the response speed, noble metal (Ru) loading into the W O3-NaN O2 sensing layer for the field effect transistor (FET)-based N O2 sensors was investigated. The sensing layer was prepared by heat-treating the mixture powder of NaN O2 and noble metal (Ru)-loaded W O3 at 300°C. The effects of loading amounts of the noble metal on N O2 sensing performances as well as the microstructure of the sensing layer have been examined. It was found that the optimization of the noble metal loading amount into the sensing layer was important for the improvement of 90% response-and recovery-times. Field emission scanning electron microscopy observations revealed that the sensing layer became porous with increasing noble metal loading amounts. However, extensive addition of Ru (above 0.2 wt % to W O3) into the sensing layer resulted in the degradation of sensing characteristics, although the sensing layer showed a highly porous structure. According to theoretical analysis based on Knudsen gas diffusion reported by Matsunaga, the diffusion of gas molecules into such a porous sensing layer is very fast. Therefore the obtained results suggested that the improvement of the response-and recovery-speeds is owing to the large contribution of noble metal nanoparticle to the electrochemical promotion rather than the diffusion of N O2 gas into the sensing layer. © 2010 The Electrochemical Society. Summary:In order to investigate the effect of the microstructure on the oxygen permeation in Ba0.95La0.05FeO3-δ membranes, three different methods such as solid-state reaction, nitrate and acetate decomposition (NAD), and amorphous malic acid precursor (AMP) methods were used to fabricate membranes with different grain sizes. The grain size of the membranes was successfully controlled from 35 to 829 μm2 via sintering at 1175°-1275°C. The oxygen permeation fluxes through the Ba0.95La0.05FeO3-δ membranes increased with a decrease in the grain size. The AMP method, using malic acid as a complexing agent, produced a membrane having the highest oxygen permeability (3.10 cm3·(min·cm2)-1 at 930°C) and the smallest grain size. The results obtained again confirmed the significant importance of microstructure control in designing high-performance oxygen permeable membranes. © 2010 The American Ceramic Society. Summary:(Figure Presented) High oxygen permeability was achieved using an asymmetric Ba0.95La0.05FeO3-δ membrane. In this membrane, oxygen diffuses physically through pores of a porous support and oxygen permeates electrochemically through a dense layer. The oxygen permeation flux of the asymmetric Ba0.95La0.05FeO 3-δ membrane reached more than 10 cm3 (STP) min -1 cm-2 from a test gas containing 50% oxygen at 930°C. © 2010 WILEY-VCH Verlag GmbH & Co. KGaA, Weinheim. Summary:In this study, gas diffusion electrodes (GDEs) with two catalyst layers were fabricated and tested for their electrode performance for oxygen reduction in an alkaline solution. The LaMnO3/carbon black catalyst layers were fabricated using a reverse micelle method to finely disperse the LaMnO 3 particles onto the carbon matrices, for which commercial Ketjen Black (KB) (1270 m2 g-1) and Vulcan XC-72R (VX) (254 m2 g-1) were used. The three-layer-structured GDE with the two LaMnO3/KB and LaMnO3/VX catalyst layers exhibited a superior oxygen reduction activity when compared to that of a conventional GDE with only one LaMnO3/KB catalyst layer. Pore size distribution and gas permeability measurements revealed that the LaMnO3/VX layer was more porous and had higher gas permeability than the LaMnO3/KB layer. These results suggest that the intermediate layer of LaMnO3/VX can efficiently supply oxygen to reaction sites dispersed in the LaMnO 3/KB and LaMnO3/VX catalyst layers, which consequently leads to an improvement in the electrode performance. © 2009 Springer Science+Business Media B.V.
Summary:In order to reduce the electric resistance of the WO3 sensing film fabricated from the ion-exchange method, lamellar-structured and Re-doped WO3 was prepared through the acidification method. The mixed solution of Na2WO4 and Re2O7 was dropped into the mixed solution of H2SO4 and HCHO. Then the obtained gel was deposited on alumina substrate with Au electrode for thick film devices and calcined at 300°C. The size of the Re-doped WO3 particles was smaller in one order in magnitude than that of the WO3 by the ion-exchange method. The electric resistance of Re-doped WO3 device in air showed minimum value at the 4 at% Re doping due to the increase in the donor density in the WO3 crystal. As a result, the Re-doped WO3 device exhibited low electric resistance less than 108 Ω even in the 800 ppb NO2. Such a low electric resistance device is suitable for the detection of the wide range of NO2. © 2010 The Ceramic Society of Japan. Summary:To explore oxygen permeable materials, oxygen permeation properties of partially A-site substituted BaFe O3-δ perovskites were investigated. Ba sites in BaFe O3-δ were substituted with cations such as Na, Rb, Ca, Y, and La by 5%. The partial substitution with Ca, Y, and La, whose ionic radii are smaller than that of Ba, succeeded in stabilizing a cubic perovskite structure that is a highly oxygen permeable phase, as revealed by X-ray diffraction analysis. This can be explained in terms of a decrease in the tolerance factor (t). Among the Ba0.95 M 0.05 Fe O3-δ (M = Na, Rb, Ca, Y, and La) membranes tested, Ba0.95 La0.05 Fe O3-δ showed the highest oxygen permeability at 600-930°C, owing to the stabilization of the cubic phase without the formation of impurity phases. From chemical analysis, the oxygen permeability of Ba1-x Lax Fe O 3-δ membranes was correlated with the amount of oxygen defects (δ) in the lattice. The oxygen permeation flux of Ba0.95 La0.05 Fe O3-δ membrane was significantly increased by reducing its thickness. Furthermore, a Ba0.975 La0.025 Fe O3-δ membrane exhibited good phase stability under He flow at elevated temperatures. The obtained results indicate the promising properties of Ba1-x Lax Fe O3-δ membranes as a cobalt-free material that has a high oxygen permeability, good phase stability, and low cost. © 2009 The Electrochemical Society. Summary:To improve the stability of Na3Zr2Si 2PO12 (NASICON)-based potentiometric CO2 sensors fitted with carbonate/Au layers (sensing electrode), mixed conducting oxides of Li0.4CoO2 and Na0.6CoO2 were examined for their applicability to solid-reference electrodes in terms of their stability against CO2 and humidity. Compared with the Na 0.6CoO2 electrode, the Li0.4CoO2 electrode showed far better stability against CO2. When the Li 0.4CoO2 electrode was coated with a layer of glass, the electrode showed no response to CO2 (200-2000 ppm) and little interference from humidity [21-86% relative humidity (RH)] at 450°C. A CO2 sensor device using Li2CO3-BaCO3 and a glass-coated Li0.4CoO2 showed stable electromotive force (emf) responses to CO2 in humid air (86% RH) at 450°C. The emf of the device was also stable even after it was exposed to humid air (86% RH) containing CO2 (400 ppm) at room temperature for 1-2 days. The present study indicates the promising features of the glass-coated Li 0.4CoO2 as a stable solid-reference material for NASICON-based CO2 sensors. © 2009 The Electrochemical Society. Summary:We fabricated porous gas sensing films composed of TiO2 nanotubes prepared by a hydrothermal treatment for the detection of organic gases, such as alcohol and toluene. The morphology of the sensing films was controlled with a ball-milling treatment and calcination at high temperature to improve the sensitivity of the films. The sensor using nanotubes with the ball-milling treatment exhibited the improved sensor responses to toluene at 500oC. The results obtained indicated the importance of the microstructure control of sensing layers in terms of particle packing density, pore size distribution, and particle size and shape for detecting large sized organic gas molecules. © 2009. Summary:To fabricate more excellent NO 2 sensor with high sensor response and good linearity between the sensor response and NO 2 concentration, the microstructure of WO 3 lamellae was controlled by adding nano-particles of SnO 2. It was found that the sintering of WO 3 lamellae was inhibited by adding nano-particles of SnO 2. The device using WO 3 lamellae added a small amount of SnO 2 nano-particles had the highest sensor response, exhibiting a high sensor response (S = 60-540) even to dilute NO 2 (100-1000 ppb) in air at 200°C. © 2009. Summary:To achieve a high oxygen permeation rate at medium and high temperature, an asymmetrically structured membrane, in which a thin dense layer (30μm) made of La 0.6Ca 0.4CoO 3-δ (LCC) and BaFe 0.975Zr 0.025O 3-δ (BFZ) was formed on a porous LCC support, was fabricated and tested for its oxygen permeability. The oxygen permeation flux significantly increased by mixing BFZ with LCC and reached a fairly high value of 1.60 cm 3 min -1 cm -2 even at 780°C. Copyright © 2009 The Chemical Society of Japan. Summary:Partially Zr-substituted BaFe 1-yZr yO 3-δ membranes were developed as a Co-free oxygen permeable membrane. In order to stabilize the cubic perovskite structure, Fe sites in BaFeO 3-δ were partially substituted with Zr 4+. In the substitution range of y=0.01-0.1, the cubic perovskite structure was stabilized even at room temperature. Among the membranes prepared, a BaFe 0.975Zr 0.025O3 -δ material (y=0.025) showed the highest oxygen permeation flux of 1.30 cm3 (standard temperature pressure) min-1 cm-2 at 930°C under an air/He gradient. The oxygen permeation flux was higher than that of partially Ce-substituted BaFe 1-yCe yO 3-δ membranes reported previously. From the results obtained by chemical and scanning electron microscope analyses, it appears that the oxygen permeability for BaFe 1-yZr yO 3-δ membranes was well correlated with the amount of oxygen defects in the lattice as well as the grain size. In addition, the oxygen permeation flux of the BaFe 0.975Zr 0.025O3 -δ membrane was significantly increased after decreasing the thickness of the membrane from 2.0 to 0.4 mm. For thin membranes (0.4-1.0 mm), the thickness dependence of the oxygen permeability deviated from the Wagner equation, suggesting that the oxygen permeation of BaFe 0.975Zr 0.025O3 -δ is controlled by not only bulk diffusion of oxide ions but also their surface reactions. © 2009 The Electrochemical Society. Summary:Preparation and morphology control of TiO2 nanostructured films for gas sensor applications were investigated. To examine the effect of the morphology of sensing films on the sensing characteristics, TiO2 with different morphologies, nanoparticles and nanotubes, were used for the film preparation. TiO2 nanotubes were prepared by a hydrothermal treatment of TiO2 nanoparticles in a NaOH solution at 160, 200, and 230 °C for 24 h and subsequent washing with an HCl solution. Uniform sized TiO2 nanotubes of 1 μm in length and 50 nm in diameter were formed at 230 °C. The sensing films composed of nanotubes prepared at 230 °C showed a high sensor response to toluene at 500 °C as compared with those composed of TiO2 nanoparticles. Scanning electron microscope (SEM) analysis and pore size distribution measurements indicated that the sensing films composed of the TiO2 nanotubes had a high porous morphology with a peak pore size of around 200 nm, which can promote the diffusion of toluene deep inside the films and improve the sensor response. The obtained results demonstrated the importance of microstructure control of sensing layers for improving the sensitivity to large size molecules like volatile organic compounds (VOCs). © 2009 Elsevier B.V. All rights reserved. Summary:Mixed potential-type gas sensors with a BiCuVOx (Bi2Cu0.1V0.9O5.35) oxygen conductor, fitted with composite electrodes made of perovskite-type oxide (La0.6Sr0.4Co0.8Fe0.2O3) and BiCuVOx, were tested for their organic gas sensing properties. A planar-type BiCuVOx-based device, in which thin sensing electrode and thick counter electrode are attached, exhibited good sensing characteristics to low ethanol concentrations (4-30 ppm) at 400 °C. The electromotive force (EMF) of the device had a linear relation to the logarithm of ethanol concentration. The 90% response and recovery times of the device were short, i.e., less than 1 min. Moreover, the planar structure successfully eliminated any oxygen interference. The ethanol sensing mechanism is based on the mixed potential generation from the simultaneous anodic oxidation of ethanol and the cathodic reduction of oxygen, at the BiCuVOx/electrode interface. © 2008 Elsevier B.V. All rights reserved. Summary:A reverse micelle method was investigated for preparing nano-sized PdO loaded on SnO2 nanoparticles. PdO-SnO2 nano-composite was prepared by precipitating Pd(OH)2 and Sn(OH)4 inside a reverse micelle. The microstructure and the gas sensing properties of obtained nanoparticles were investigated. Although the particle size of SnO2 was as same as ca. 10 nm at each observed sample, the particle size of PdO got larger as increasing with loading amount of PdO because of agglomeration of PdO nanoparticles each other. As a result of the gas sensing measurement, it was found that the particle size of PdO on SnO2 nanoparticle influences the gas sensing property closely. That is, the sensor response declined gradually with increasing the particle size of PdO although the maximum of the sensor response was obtained in PdO = 0.1 mol%. In this method, small amount of PdO loading can be achieved as compared with PdO-loaded SnO2 sensor prepared by the conventional impregnation method. © 2008 Elsevier B.V. All rights reserved. Summary:Tungsten trioxide (WO3) was prepared by acidification of Na2WO4 with acid solutions such as H2SO4, HCl, and HNO3 (pH 0.5 to -0.8) and tested for its NO2 sensing properties. Acidification with strong acid solutions (pH -0.5, -0.8) was found to produce lamellar-structured WO3 particles, which consisted of nano-sized crystalline plates that were 100-350 nm in lateral size and 20-50 nm in thickness, as observed by XRD and SEM analyses. The sizes of the primary and secondary particles were decreased by decreasing the pH of the acid solution used. This was accompanied by an increase in the specific surface area. The NO2 responses of the prepared WO3 lamellae were dependent on their morphology. The device using smaller WO3 lamellae prepared with a H2SO4 solution (pH -0.8) had the highest sensor response, exhibiting a high sensor response (S = 150-280), even to dilute NO2 (50-1000 ppb) in air at 200 °C. The use of smaller lamellae resulted in a decrease in the electrical resistance of the device, probably due to intimate contact between smaller lamellar particles, which allowed the detection of NO2 in a rather wide concentration range. In addition, the developed device showed high NO2 selectivity without substantial interference from NO. © 2008 Elsevier B.V. All rights reserved. Summary:The perovskite-type SmFeO3 powders were prepared by the four different methods, named decomposition method of heteronuclear cyano complexes (CN), polymer precursor method (PP), reverse micelle method (RM) and reverse homogenous precipitation method (RHP), and their catalytic activities were evaluated with a CO oxidation reaction. The surface areas and the surface chemical compositions of Sm, Fe, O and C were strongly dependent on the preparation methods and calcination temperatures. On the basis of such the characteristics on the surface the factors controlling the catalytic activity are discussed. © 2008 Elsevier B.V. All rights reserved. Summary:A FET type NO2 sensor fitted with NaNO2-RU/WO3 as a new auxiliary (sensing) layer was fabricated and tested for its NO2 sensing properties. The developed device responded to dilute NO2 of ppb concentrations (20-300 ppb) at 130 and 170 °C. The sensor signal (VGs; gate-source voltage) is linearly proportional to the logarithm of NO2 concentration, exhibiting the Nernstian response. It was found that the response speed was improved at lower operating temperature by adding Ru to the NaNO2-WO3 auxiliary layer. It was suggested that Ru nanoparticles deposited in the auxiliary layer with a porous morphology improved the rate of adsorption and electrochemical reaction of NO2 occurring at the interface between the Au gate electrode and auxiliary layer. Copyright © 2008 American Scientific Publishers All rights reserved. Summary:To achieve high-efficiency oxygen permeation using mixed (ionic and electronic) conducting perovskite-type oxides, we examined asymmetric-structured membranes of La0.6Ca0.4CoO3 in which a thin dense membrane was deposited on a porous support. The La0.6Ca 0.4CoO3 porous support was fabricated using irregular-shaped precursor particles prepared through an oxalate method. The fabricated support had good gas permeability and thermal stability, showing sufficient properties as a support for dense thin membranes. A dense membrane of 10 μm thickness was successfully formed on the porous support by coating a La0.6Ca0.4CoO3 slurry and subsequent densification by sintering. The deposited thin membrane was gastight and free from clacks, as revealed by gas permeation tests and SEM observations. The asymmetric membrane exhibited a high oxygen permeability of 1.66 cm3 (STP, standard temperature and pressure) min-1 cm-2 at 930 °C, which was four times higher than that of a typical sintered-disk type membrane with 1200 μm thickness, demonstrating its feasibility as a high-performance oxygen separation membrane. © 2008 American Chemical Society. Summary:An asymmetric-structured membrane, in which a dense thin La0.6Ca0.4CoO3 layer of 10 μm was deposited on porous La0.6Ca0.4CoO3 support by a slurry dropping method, were tested for its oxygen permeability at 630-930 °C. In order to increase the oxygen permeability, porous La0.6Ca0.4CoO3 and SrCo0.8Fe0.2O3 - δ oxygen evolution layers were attached on the dense layer. It was found that the asymmetric structured membranes with the porous oxygen evolution layers showed remarkably higher oxygen permeability as compared with a conventional sintered disk-type membrane (1200 μm). This suggests that oxygen permeation through membranes of 10 μm in thickness is rate-determined by both bulk O2- diffusion and oxygen evolution reaction. The maximum oxygen permeability reached 4.77 cm3 (STP) min- 1 cm- 2 (3.54 × 10- 6 mol cm- 2 s- 1) at 930 °C for the asymmetric membrane with porous La0.6Ca0.4CoO3 oxygen evolution layer of 10 μm in thickness (STP = Standard Temperature and Pressure). Further improvements in the oxygen permeability would be achieved through control of the micro-structure of the oxygen evolution layers. © 2008 Elsevier B.V. All rights reserved. Summary:A high-speed gas-switching system, in which a low-dead volume chamber (0.6 cm3) was connected to a gas flow apparatus equipped with a high-speed gas-switching valve operative at a rate of 30 ms, was designed to investigate the real response and recovery properties of semiconductor gas sensors. The developed system allowed rapid replacement of the gas atmosphere in the chamber where a gas sensor device was placed within 0.3 s. It was revealed that the response speed of the sensor device based on a SnO2 porous film (pore size at maximum population: 37 nm) was remarkably fast, reaching a response time of less than 1 s for H2 and CO detection at 250 and 350 °C. This suggests that the diffusion and surface reaction of H2 and CO are quite fast in the porous film. On the other hand, the recovery speed was not comparably fast and the resistance of the device did not recover to the original state within 20 s after switching the gas atmosphere in the chamber from the sample gases to air. This is possibly due to the slow desorption of the H2O and CO2 that were formed by the surface reaction of H2 and CO, respectively with the adsorbed oxygen on SnO2. © 2008 Elsevier B.V. All rights reserved. Summary:To improve the stability of a NASICON (Na3 Zr2 Si2 PO12; Na+ conductor)-based potentiometric CO2 sensor under humid conditions, a composite of BiCuVOx (Bi2 Cu0.1 V0.9 O5.35) and perovskite-type oxide (La0.6 Sr0.4 Co0.78 Ni0.02 Fe0.2 O3) was used as a solid-reference electrode. The CO2 sensing properties and stability of a NASICON-based planar device fitted with Li2 CO3 - BaCO3 (auxiliary phase) and the composite reference electrode were examined under humid conditions. The planar device mounted on an alumina substrate with a Pt heater showed stable electromotive force (emf) responses to changes in the CO2 concentration (100-400 ppm) at 400 and 450°C in humid air without degradation. The sensor device also exhibited a good warming-up characteristic, i.e., the emf of the device quickly reached a steady and constant value when the sensor operation was restarted even after the sensor was exposed to humid air (86% relative humidity at 25°C) at room temperature for a long time. © 2008 The Electrochemical Society. Summary:A potentiometric organic gas sensor-based on BiCuVOx (Bi2Cu0.1V0.9O5.35) solid electrolyte was investigated. Electromotive force (EMF) of the sensor device, in which a BiCuVOx sintered disk is fitted with composite electrodes of BiCuVOx/La0.6Sr0.4Co0.78Ni0.02Fe0.2O3, was measured in the presence of various organic gases at 350-500 °C. The device responded to volatile organic compounds (VOC) of formaldehyde, toluene, and ethanol, but showed little sensitivities to methane, propane, propene, CO, and H2. The EMF of the sensor was linear to the logarithm of organic gas concentrations, suggesting that the generation of EMF is explained on the basis of the mixed potential theory. The observed good sensitivity toward VOC derives from the good oxide ion conductivity of BiCuVOx and proper electro-catalytic activity of the perovskite oxide electrode even at lower temperature. © 2008 Elsevier B.V. All rights reserved. Summary:A laminated solid-reference electrode of BiCuVOx (Bi 2Cu0.1V0.9O5.35)/Jperovskite-oxide (La0.6Sr0.4Co0.78Ni0.02 Fe 0.2O3) was developed for a NASICON (Na3Zr 2Si2PO12; Na+ conductor)-based potentiometric CO2 sensor. The fabricated electrochemical cell expressed as, CO2, O2/Au (sensing electrode)JLi 2CO3-BaCO3 (auxiliary phase)JNASICON/ BiCuVOx/BiCuVOx-perovskite-oxide (reference electrode) /O2, responded well to changes in CO2 concentration (100-400 ppm) at 450°C under high humid conditions (88%RH). The potential of the developed reference electrode was stable and exhibited little interference by water vapor. Furthermore, the reference electrode potential did not response to CO2 even after the BiCuVOx layer was contaminated with carbonate, indicating a good stability of BiCuVOx against CO 2. The sensor device attached with the laminated solid-reference electrode showed a good warming-up characteristic, i.e., the electromotive force (EMF) of the device reached a steady and constant value when the sensor operation is re-started even after the sensor was exposed to humid air containing CO2 at room temperature. Summary:Two ways of reverse micelle (RM) method were investigated to prepare carbon-supported nano-sized LaMnO3 with high oxygen reduction activity. Hydrolysis precipitation in reverse micelle (HP-RM) method could give nano-sized particles of LaMnO3 easily because the particles size decreased with decreasing Rw (=[H2O]/[surfactant]) value as well as nitrate concentration. The electrode prepared by the resulting particles showed high oxygen reduction activity as compared with that prepared by mechanical mixing-method. Furthermore, it was found that new RM method (ROP-RM) using KMnO4 as an oxidizer gave higher oxygen reduction activity than the HP-RM method, although particle size of LaMnO3 obtained by the ROP-RM method was almost same as that by RM-HP method. © 2007. Summary:A novel method by combining NAC-FAS (NAnometer-sized Crystal Formation in Alcoholic Solutions) method and mechanical milling treatment was successfully applied for dispersing perovskite type oxide LaMnO3 finely on carbon support. Microscopic observation revealed that nano-sized oxide particles were dispersed fairly well in the carbon support. The gas diffusion-type electrode prepared by means of reducing number and quantity of chemicals exhibited more excellent oxygen reduction activity than the electrodes containing LaMnO 3 prepared by RHP (Reverse Homogeneous Precipitation) method. It allowed current density as high as 300 mA cm-2 at -80 mV (vs. Hg/HgO) in 8 M KOH at 60 °C under air flow. © Springer Science+Business Media, Inc. 2006. Summary:La1-xSrxMn0.8Fe0.2O 3+δ (x = 0-0.4) and La0.8Sr0.2Mn 1-yFeyO3+δ (y = 0-0.8) supported on carbon were successfully prepared by a reverse micelle method. Aqueous solutions dissolving nitrates of constituent metals of the intended oxides and tetramethylammonium hydroxide (precipitant) were separately transformed into reverse micelle dispersions by using poly(oxyethylene)5-lauryl ether (surfactant) and cyclohexane (oil). These dispersions were mixed together to derive a reverse micelle dispersion containing mixed hydroxides as precursors of the oxides, into which carbon powder suspended in cyclohexane was put under agitation. The suspension was destabilized with ethanol, and the resulting precipitate (carbon-supported precursors) was calcined in N2 atmosphere to prevent the carbon matrix from being combusted. Single-phase oxides supported on carbon were obtained by calcination at 700°C unless the oxides were free of Fe. Oxygen reduction activity of the gas-diffusion-type electrodes fabricated with thus prepared carbon-supported oxides increased sharply and decreased gradually with increasing x and y, respectively. Among the prepared oxides, the greatest activity, i.e., 500 mA/cm2 at -67 mV (vs. Hg/HgO electrode) in 9 M NaOH at 85°C under O2 flow, was achieved by the oxide with x = 0.4 and y = 0.2. Optimal loading on carbon as well as durability under oxygen reduction conditions were tested for selected oxides. 17 wt % La0.6Sr0.4Mn0.8Fe 0.2O3+δ loading electrode was compared with 27.7 wt % Pt-loading electrode in an oxygen reduction activity, and it was found that the former electrode was better than the Pt loading electrode. © 2004 the electrochemical society All rights reserved. Summary:Reverse micelle (RM) based synthesis of carbon-supported perovskite type oxide (LaMnO3) was investigated. By using cyclohexane as oil phase, six kinds of nonionic surfactants were tested for the formation of the revere micelle dispersions containing aqueous solutions of mixed nitrates of La 3+ and Mn2+ (RM-N) and tetramethylammonium hydroxide (RM-A) at the water/surfactant molar ratio (Rw) of 3. RM-A was found to be more difficult to form compared with RM-N or the RM containing pure water. At a temperature range of 5-25°C, it was given only by the surfactants with hydrophilic-lipophilic balance (HLB) values of 10.0-10.9. Phase diagrams of oil-surfactant-alkaline solution (or pure water) were constructed at 5 and 15°C for the best two surfactants, i.e., poly-(oxyetylene) 6-nonylphenyl ether and poly-(oxyetylene)5-lauryl ether. Mixing RM-N and RM-A together gave the RM containing a mixed hydroxides-precursor (RM-P), which was further converted into carbon-supported LaMnO3 through a series of treatments including the addition of carbon powder and calcination in N2 atmosphere at 600°C. The size of RM-P as well as that of the LaMnO3 grains supported on carbon could be controlled well by selecting Rw. The carbon-supported LaMnO3 proved to be highly active for the electrochemical reduction of oxygen. © 2004 The Electrochemical Society. All rights reserved. Summary:Modulation excitation diffuse reflectance infrared Fourier transform spectroscopy (DRIFTS) together with resistance measurements has been carried out to study water isotopic exchange on undoped SnO2 materials as a function of CO concentration. We compare two materials synthesized via hydrothermal treatment and different only in their precursors: SnO2 Ac synthesized from tin(IV) hydroxide acetate and SnO2 Cl from tin(IV) chloride pentahydrate. DRIFTS and resistance measurements were performed simultaneously in an environmental chamber at 300 °C and in a flow of humid air. The annealed materials were found to have similar particle sizes (16±7 nm), crystallite sizes (12±2 nm) and pore size distribution (9±1 nm). However, sensor tests showed notably higher responses to CO in the presence of water vapor for SnO2 Ac. Electronic effect of CO chemisorption quantitatively correlates with consumption of bridging hydroxyls on the latter surface upon increasing concentration of CO from 0 to 500 ppm in humid air. No such correlation was found for SnO2 Cl. Water desorption kinetics was found to be slower for the latter by ca. 30 % with respect to SnO2 Ac. Low activity of surface OH groups and consequently low sensor signals of SnO2 Cl were proposed to originate from traces of Cl ions found in the material after the synthesis despite negative Cl test before the hydrothermal treatment. © 2013 SPIE. Summary:We attempted the photo-chemical recovery of noble metals from solutions using inorganic-organic hybrid photocatalysts based on polyoxometallates (POMs) such as PMo12O40 3-, SiW12O40 4-, and γ-SiW10O36 8- coupled with a cationic surfactant, dimethyldioctadecylammonium (DODA). We also used γ-SiW10O36-O(SiC18H37)2 as a photocatalyst. The four different photocatalysts dissolved in chloroform successfully photoreduced gold ions dissolved in water in a two-phase (chloroform/water) system under UV irradiation (λ< 475 nm). The γ-SiW10O36/DODA photocatalyst exhibited the best activity and was able to recover gold from solution. It was suggested that one-electron reduced γ-SiW10O36 9-, which was formed by UV irradiation, reduced gold ions to produce large two-dimensional particles. The formation of sheet-like particles indicates that the reduction of gold ions occurred at the interface between chloroform and water. © (2013) Trans Tech Publications, Switzerland. Summary:Semiconductor gas sensors are device consisting of sintered metal oxides, which can indicate target gas concentration by measuring the electric resistance of device. The gas sensors have been developed widely for detection of inflammable gases, toxic gases, odor gases, environmental-related gases and so on. As the materials, n-type oxides, such as SnO 2, In 2O 3, WO 3 and so on, are well known. For the material design of the semiconductor gas sensor, we have reported important three functions i.e. receptor function, transducer function and utility factor. In this presentation, the material design for high-sensitive detection of environmental-related gases is shown. © 2011 IEEE. Summary:The deposition of Pd nanoparticles onto thiol-functionalized SnO 2 nanoparticles was carried out at the aqueous/organic liquid/liquid interface to prepare Pd-loaded SnO2 nanoparticles for high-sensitive sensor materials. The method is based on the self-assembly deposition of Pd onto dimercaptosucinic acid (DMSA)-functionalized SnO2 nanoparticles (mean diameter: 4 nm) prepared by a hydrothermal method. Pd nanoparticles of 2-3 nm in chloroform were prepared by thermal decomposition of a Pd complex at high temperature (170°C). Thin film-type device using the prepared Pd-loaded SnO2 nanoparticles was fabricated and tested for its sensing properties. © 2008 Trans Tech Publications. Summary:Recently, we have proposed some theoretical models, power laws and effect of particle shape and size, for semiconductor gas sensors. The models show that a depletion theory of semiconductor can be combined with the dynamics of adsorption and/or reactions of gases on the surface. In the case of SnO 2, the relative resistance (R/R0) is proportional to PO2 n, where n is a constant value (n=1/2) on oxygen partial pressure. In addition, carrier concentration in SnO2 influences depth of the depletion. In this study, to experimentally reveal such effects, we tried to control the carrier concentration in SnO2 by foreign doping and examined their electrical resistance and sensor response. Correlations between doping concentration, crystalline size, and partial pressures of oxygen and H2 on the electric resistance are discussed to reveal the material design for semiconductor gas sensors. © 2008 Trans Tech Publications. Summary:In order to improve the stability of a NASICON (Na3Zr 2Si2PO12; Na+ conductor)-based potentiometric CO2 sensor under humid conditions, a new solid-reference electrode of the BiCuVOx (Bi2Cu0.1V 0.9O5.35)/perovskite-type oxide (La0.6Sr 0.4Co0.02Ni0.02Fe0.2O3) composite was investigated. The fabricated electrochemical cell (CO 2+O2, Au/ Li2CO3-BaCO3/ NASICON/ BiCuVOx-La0.6Sr0.4Co0.78Ni 0.02Fe0.2O3, O2) responded well to changes in CO2 concentration (100-400 ppm) at 400-450 °C under high humid conditions (86 %RH) without degradation. The sensor device also exhibited a good warming-up characteristic, i.e., the electromotive force of the device quickly reached a steady and constant value when the sensor operation is re-started even after the sensor was exposed to high humid air at room temperature. ©2007 IEEE. 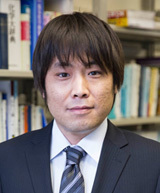 Ministry of Education, Culture, Sports, Science and Technology, Grants-in-Aid for Scientific Research(若手研究(B)), Nano-materials Design for High Performance Metal-Air Batteries, Masayoshi YUASA, In order to improve the electrode potential for the oxygen reduction reaction of air electrode, the effect of the composition of La-Mn based perovskite-type oxides on the oxygen reduction activity and the effect of the doubly loading of LaMnO3 and Pt on the carbon-support were investigated. As the result of substituting Ca and Fe for LaMnO3 nanoparticles, the optimum oxygen reduction activity was obtained at Ca=0.4 and Fe=0.1 because the valence state of B-sipe in the perovskite-type oxide was well optimized. The doubly loading of LaMnO3 and Pt on the carbon-support revealed that Pt is effective to improve the on-set potential for the oxygen reduction reaction, and that LaMnO3 is effective to reduce the overpotential for oxygen reduction reaction. Ministry of Education, Culture, Sports, Science and Technology, Grants-in-Aid for Scientific Research(若手研究(B)), Investigation of electrode materials of gas diffusion electrodes for rechargeable metal-air batteries, Masayoshi YUASA, Metal-air batteries have higher theoretical energy densities compared with other chemical batteries because they utilize oxygen in the air as one of their electroactive materials. Therefore, metal-air batteries have been paid attention as a next generation energy device. However, air electrodes in metal air batteries are problematic because the carbon black can be oxidized to water soluble organic compounds, under anodic polarization. Therefore, we have looked at the use of LaNiO_3 as a possible electrode material to replace carbon black because LaNiO_3 has both high conductivity and high oxygen evolution activity. As the result, we found that LaNiO_3 has a much higher stability against anodic polarization when compared to carbon black, and that fabrication of LaMnO_3/LaNiO_3 composite made air electrodes to work as bi-functional electrodes.